A new packaging system at Del Monte’s giant plant in Modesto, CA, FILLS AND SEALS 700 four-oz fruit cups/min and THEN STERILIZES them in two batch retorts. The setup includes a sophisticated tray system that transports the cups to and from the retorts. Del Monte Food Company's plant in Modesto, CA, started life as a tomato processing facility, before being converted to fruit processing in 1999. It now processes fresh peaches, pears, apricots, grapes and cherries and also produces various combinations of Del Monte's branded finished products such as fruit cocktail, mixed fruit, diced and sliced peaches, Orchard Select, fruit cups, Fruit Chillers, pears and pineapple products in various container sizes and materials including metal cans, plastic cups and glass jars. The plant is housed on 84 acres, has 500,000 sq ft of production floor area and 1,000,000 sq ft of warehouse/shipping space, produces more than 30,000,000 finished cases/year and employs 1,800 people during the peak season. 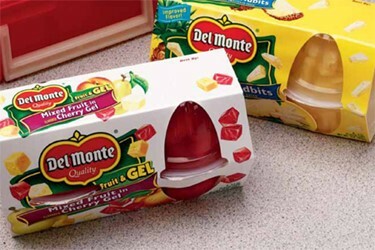 In 2005, Del Monte Foods introduced a line of shelf-stable, fresh-fruit products in four-oz cups that included varieties of Del Monte mixed fruit with syrup, Del Monte jello cups and other products. For this project, PTI compiled a fully automated, turnkey operation that consists of high-speed filling and sealing of the product, retort sterilization and automated package handling from the filler and sealer in and out of the retorts to the downstream equipment. This large-scale operation, which produces more than 700 cups/min, consists of a Waldner Dosomat in-line 20.24, two-index by 12-lane-wide cup-filling/sealing system that fills/seals 24 cups/cycle, two Steriflow batch-retort sterilization systems that can hold 21,888 cups each and LAN automated cup-handling systems that provide automated loading, transport and unloading of the retort stacks. PTI is the North American agent for Waldner, Steriflow and LAN. The machinery was indeed successfully installed in Del Monte’s Modesto plant in July 2006, and is now operating 24 hr/day, seven days/week. The output is almost three times the production rate of Del Monte’s standard filling/sealing line, which averages 240 cups/min and requires several operators for each line. The PTI line has three operators plus two people loading cups. 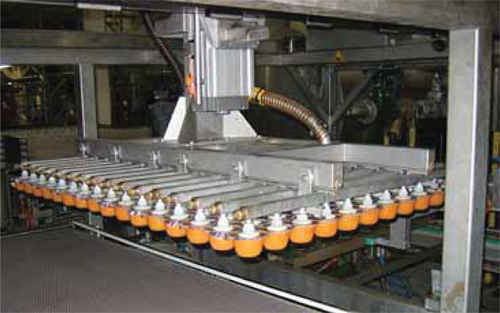 Cups, which are supplied by PrintPac, Inc. (www.printpack.com), are transported through the Waldner cup/filler/sealer on slat carriers that have 24 cavities each. Workers manually load the cups into 24 horizontal channel conveyors that deliver them to the front of the machine, where suction cups reach up through the open cavities in the carriers and pull the cups down into the cavities. The intermittent-motion machine features four filling stations—a minor fruit filler, a major fruit filler, a liquid filler and a liquid fill-to-level filler—followed by the sealing station. The 12-lane-wide machine indexes two lanes at each cycle for a total of 24 cups per cycle. Each four-oz cup contains about three oz of fruit and one oz of light syrup. The first filler on the machine, the minor-fills cherries or pineapple, which are used mainly for decoration and taste. The 12-lane wide, intermittent-motion filler indexes two lanes per cycle for a total of 24 cups per cycle. Each four-oz cup contains about three oz of fruit and one oz of light syrup. These are filled by four filling stations—a minor fruit filler, a major fruit filler, a liquid filler and a liquid fill-to-level filler. After filling, the cups are conveyed to the sealing area, where they are steam or gas-flushed and then sealed by conduction heat. The minor fruit filler features a hopper with 24 pockets in the bottom. Product is delivered to the hopper by a vibratory feeder, and an open screw inside the hopper distributes the product from the center to the hopper extremities to ensure constant product level in the hopper. A base plate in the bottom of the hopper vibrates to allow product to fill the pockets, after which sliding plates in the bottom of the pockets open to allow the product to discharge into the plastic cups. Because cherries and pineapple are so different, filling them presented a challenge. To ensure complete filling of the pockets, stainless-steel rods mounted above the pockets carry out a slow, synchronized, horizontal motion. This system is gentle on the product and ensures that the product is loosened above the pockets and does not bridge. Next, the cups travel to the major fruit filler, which fills most of the solid product, such as diced fruit. Here again, the fruit is loaded into a hopper that discharges into 24 pockets and the fruit is delivered to the hopper. The pockets have sliding plates on the top and bottom. The top plates open to allow product to fill the cups. They then close, and the bottom plates open to discharge the product into the plastic cups. As with the minor fruit filler, two stainless steel rods mounted above the pockets carry out a slow, synchronized, vertical oscillating motion overlapped with a horizontal motion in the opposite direction to ensure complete filling of the pockets. This system also is gentle on the product and ensures that the product is loosened above the pockets and does not bridge. The third filler dispenses 80 to 90 percent of the syrup into the cups through 24 nozzles. This is a gravity unit that regulates the volume of syrup by adjusting the time that the valves are open. The fourth filler is a gravity-fed unit that fills the syrup to the top of the cup. This will be a variable quantity that depends on the volume of the fruit in the cup. In this operation, the 24 cups are raised and the spring-loaded valves open. When the product reaches the tops of the cups, the valves close and the remaining syrup is drawn up by a proprietary suction system. After filling, the cups are conveyed to the sealing area, where they are steam or gas-flushed and then conduction heat-sealed using a beaded-type profile sealer. In this operation, film from a roll is pulled across the machine and all 24 cups are lifted against it. Hot sealing heads are driven down by cams and apply pressure to seal the film against the rims of the cups. This combination of heat and pressure will seal through the product and/or syrup on the rim and ensures the integrity of the seal. The lid material is supplied by Curwood, Inc. Next, the cups are conveyed to the cutting station, where serrated circular dies descend and cut the film around the tops of the cups. The waste film is pulled onto a roll on top of the machine and discarded. Cups leaving the filler/sealer are transferred to retort trays by vacuum grippers. Each tray holds 192 cups. After sealing, the cups travel past a coding station where four ink-jet printers from Videojet Technologies, Inc. travel across the machine and print production information on the tops of the cups. Each printer prints data on six cups while the filler/sealer slat conveyor is at its resting position during the indexing cycle. The cups then travel to the discharge of the Waldner machine, where they are transferred to retort trays on the LAN system. Each tray holds 192 cups, which is the content of eight carrier slats on the filler/sealer. In this transfer operation, a slide with 96 vacuum grippers in an 8x12 configuration moves over four carrier plates and lifts out the filled and sealed cups. The slide then moves over the retort tray, where it places the cups. It requires two transfer operations to fill the tray with 192 cups. The cups are placed closer together in the trays than they are in the filling/sealing machine, so the pick-and-place transfer system moves the cups closer together as it travels from the filler/sealer to the retort tray. The transfer system then opens up as it travels back to the filler/sealer for another load of cups. Trays of cups are assembled into stacks that contain 19 trays and 3,648 cups. When six stacks have accumulated, shuttles transport them to the retort. The automated LAN system assembles trays into stacks, delivers the stacks to two retort sterilizers and transports retorted trays from the sterilizers to a point where they are delivered to downstream packaging, all without human intervention. To start this procedure, trays leaving the filler/sealer are assembled into stacks that contain 19 trays and 3,648 cups. When six stacks have accumulated, they are transported to the Steriflow retort by shuttles. This system has two retorts and two shuttles; one shuttle transports trays to the retorts, while the other transports retorted trays back onto the LAN system. Each Steriflow retort consists of a 5-ft diam chamber that holds six stack-assemblies containing 21,888 cups. The two Steriflow systems run simultaneously to process more than 40,000 cups during a single retort cycle. The Steriflow retort features a patented, super-heated, cascading water system that operates typically at about 221 deg F with variable internal overpressure to sterilize the cups of product. 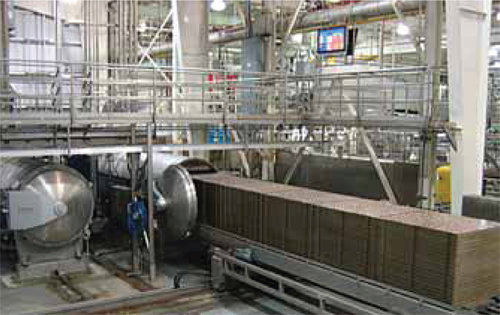 After the product is sterilized, cold water cascades down over the cups to cool them to 80 deg F, after which the six stacks are removed from the retort. A complete retort cycle takes about 30 min. The stacks leaving the retort travel to a LAN machine that unstacks the individual trays and places them on a LAN conveyor that transports them to a station where vacuum grippers remove the cups from the trays and place them on a conveyor that takes them to the sleeve wrapper. After the cups have been removed, the trays travel to a tipping station, where each stack is tipped to remove any cups that have not been removed by the grippers. 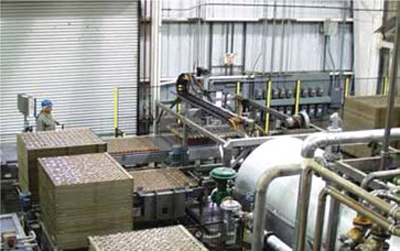 The trays then are conveyed back to the loading station and repeat the cycle. After retorting, the individual trays are unstacked and transported to a station where vacuum grippers remove the cups from the trays. A significant advantage of this integrated system is that the controls for the filler/sealer, retorts and the LAN system, all of which are supplied by Rockwell Automation, are also integrated. An operator can observe machine parameters and enter commands or data at any machine and it will be transmitted to all elements of the system.